I promised I would let folks know when we knew more about the carp die-off at Calamus Reservoir, https://barbsandbacklashes.wordpress.com/2010/08/26/calamus-carp-die-off/ . We have received the results back from the fish disease laboratory and we now have some answers. Initially, the lab did not detect any viruses or other diseases. What they noted was that the carp were in very poor condition, very skinny, almost no fat, and apparently were having a hard time finding anything to eat. Remember that, because it is an important detail. Additional testing DID find koi herpes virus and that was the cause of the carp die-off. In my earlier post I pointed out that a disease like the koi herpes virus can be present in a population and not cause any problems UNLESS the fish become stressed in some way. We have had a lot of common carp in Calamus, all about the same size and likely members of the same year class and apparently there were so many of those fish that they could not find enough food. So, they became skinny, stressed, the conditions were right for koi herpes virus, and voila; there was an outbreak. I believe this is the third time that koi herpes virus has been documented in Nebraska. One was an outbreak at a private hatchery, and the other was a wild population. So, koi herpes virus is likely present in other Nebraska waters, but has not been evidenced in other die-offs; at least not that we have documented, yet. Koi herpes virus has been found to infect common carp, perhaps goldfish and grass carp. Die-offs have been recorded only for common carp, Cyprinus carpio (remember that koi are nothing more than very colorful Cyprinus carpio). Koi herpes virus can be spread through water, obviously through infected fish, perhaps through other animals and perhaps on other surfaces. Herpes viruses are common and this stuff might be spread about in a lot of ways and we honestly do not know a lot about it. Now, before everyone jumps to the conclusion that this is a good thing, afterall it killed a bunch of carp, keep a couple of things in mind. Again I mentioned this in my earlier blog post, but let me say again that viruses are known for rapid mutation. Viral Hermorrhagic Septicemia (VHS) was a viral disease that for years was known to infect salmonids. Then, just a few years ago VHS was confirmed in other species and began causing die-offs of yellow perch and muskellunge. VHS is a major concern throughout the country now and has dramatically impacted fish culture, fish management and especially fish stocking. So, koi herpes virus is not necessarily something we want to go spreading around the waters of the state. This raises some real concerns when we have a state fish hatchery sitting right below and receiving water from Calamus Reservoir. I would NOT expect this to be any kind of “magic bullet” for managing common carp or any other species of carp. First of all, koi herpes virus can be present and never cause any die-offs. Secondly, there has been no documentation of koi herpes virus, at least none that I have heard of, in silver carp or bighead carp. I will mention this, because I have been asked this week, there is nothing to worry about if you want to go to Calamus to fish or even swim. The koi herpes virus is NOT a threat to humans. But if you go, you will likely see some dead carp. I cannot think of anything else; that is really about all we know at this time. Again, I know we sort of shrug it off when it is only a bunch of dead carp, but if you happen to notice die-offs of carp in other waters, let us know about it. But let me define what I mean by a “die-off”–I am not talking about a dead fish here or there as that usually amounts to nothing more than the normal, natural mortality. What I am saying is if you are seeing hundreds of dead fish, then you should notify someone; contact the nearest Game and Parks Commission regional office, the local conservation officer or the Nebraska State Patrol pollution complaint number, 402-471-4545 (other numbers can be found in the Fishing Guide, http://outdoornebraska.ne.gov/Fishing/guides/fishguide/pdf/FishGuide.pdf ). Remember, the best chance we have to determine the cause of any fish kill is to be notified as soon as possible. If we need to collect samples, they need to be collected while the fish are still dying. 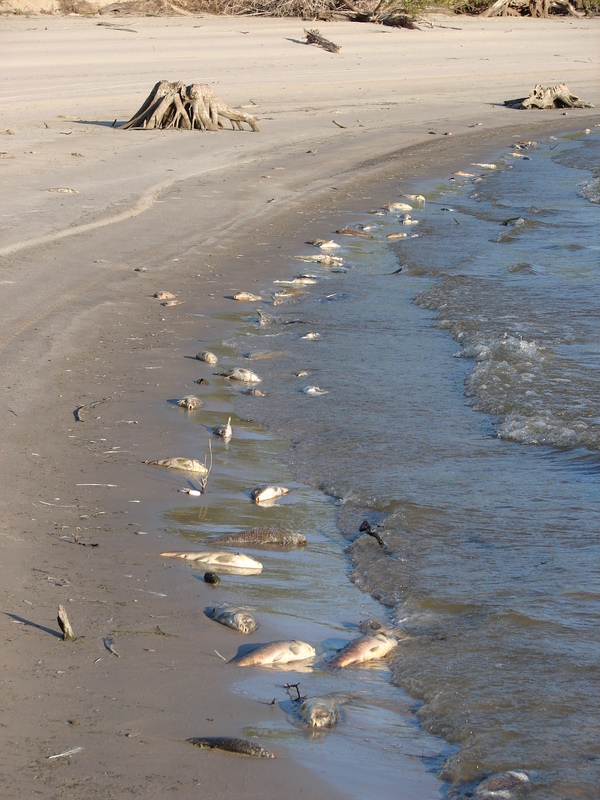 Oftentimes when there is nothing but a pile of dead fish, it is difficult to determine the exact cause of the fish kill. The one question I have is how has the carp population been so successful to this point? What the heck does a mess of carp eat in this place? Do they eat their own fry? I would guess part of the reason carp do so well in Calamus is the Calamus River that feed the reservoir–that river gives them some excellent spawning habitat. We have done no food habits studies on common carp in Calamus Reservoir, so I have no idea what they eat. Carp are omnivores and will eat just about anything, usually aquatic insects and vegetative matter, but they can eat other fish. I have seen carp eating small gizzard shad, but I doubt if they were eating their own young. This die-off may be an “adjustment” of the Calamus carp population so that it will be more in line with what that habitat can support. We will see what the carp population looks like there in the future. Does the dead fish cause an order problem in the Camp Site area? Yes, I have heard that depending on the wind direction it does stink around there. That should get better as the fish quit dying and the carcasses decay.